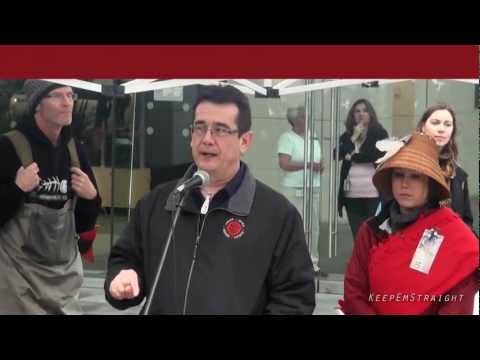 Mar.1st 2013 Save Our Salmon Rally Vancouver BC: Chief Bob Chamberlin Chief of the Kwicksutaineuk Ah-kwa-mish First Nation stands up to defend the coastal waters of BC from the severe adverse effects of fish farms & the resulting disrespect for scientific documentation on such coming in from all over the globe. Not only nature’s irreplaceable gifts are being disrespected, regulations also have been broken while governments seem to be looking the other way to not interfere with corporate goals of profit at whatever the cost to all living things. Thanks for watching.